These dividend strategies are constructed differently and may be used to accomplish different objectives. For example, investors seeking a greater-than-average income may choose high dividend yield strategies. But these strategies tend to have significant weightings in sectors that are highly sensitive to interest rate movements, thus introducing interest rate risk into the equity allocation. On the other hand, strategies focused on stocks that have grown their dividends consistently (but don’t always have the highest yields) may provide an all-weather dividend solution—one that has the potential to perform well regardless of the direction of rates. Let’s examine two popular dividend indexes as an example: S&P 500® Dividend Aristocrats® Index (dividend growers) vs. Dow Jones U.S. Select DividendTM Index (high dividend yielders). For illustrative purposes only. Source: Bloomberg, 5/2/05–3/31/17. Results show average performance of dividend strategies based on monthly interest rate changes. S&P 500 Dividend Aristocrats measures the performance of S&P 500 companies that have increased dividends every year for the last 25 consecutive years. Dow Jones U.S. Select Dividend Index represents the United States’ leading stocks by dividend yield; this index is shown here because it is tracked by the largest high dividend yield ETF by assets. Past performance is not a guarantee of future results. There is no guarantee dividends will be paid. Companies may reduce or eliminate dividends at any time, and those that do will be dropped from the indexes at reconstitution. 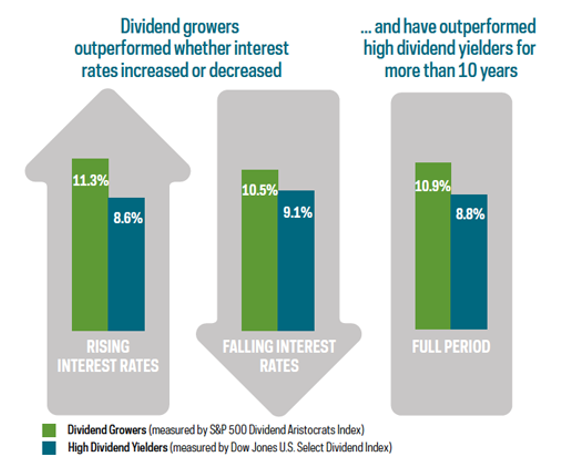 As investors consider dividend strategies, it’s important to note the difference between high dividend yield strategies and dividend growth strategies. While the former may provide the higher income many investors crave, they tend to be sensitive to interest rate movements. The latter, on the other hand, offer all-weather potential, having performed well in a variety of interest rate environments.